FOR HIGH RESOLUTION PRINT PLEASE CLICK HERE. 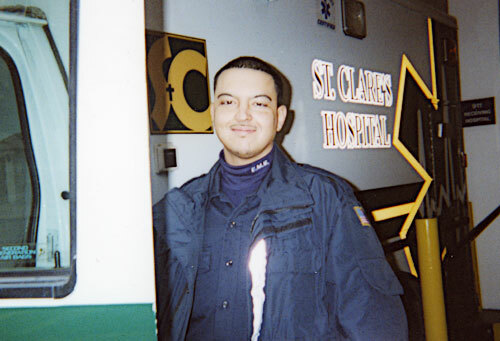 Dante Michael Perales as an Emergency Medical Technician for St. Clare's Hospital in New York City. Honor Guard from Orlando Police Department. ORLANDO, Fla. -- Orlando police continue to mourn the loss of one of their own. Rookie officer Dante Perales was killed Saturday in a car crash. 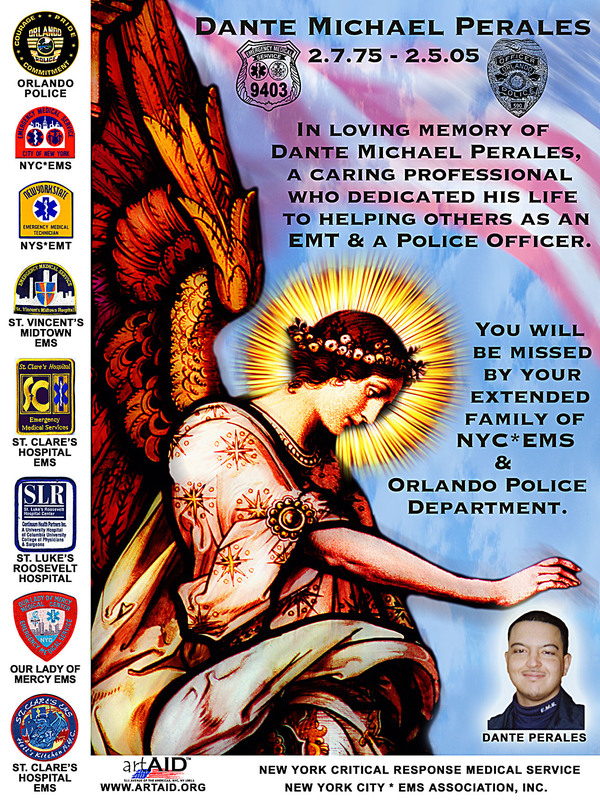 Sadly, Perales came to Orlando to escape the memories of death that haunted him in New York City. 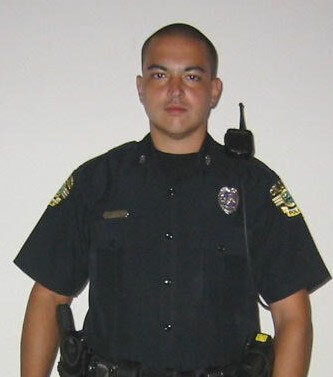 Perales was with the Orlando Police Department less than a year. 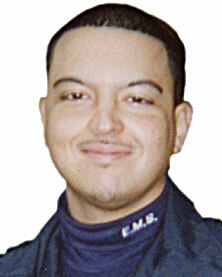 His family and friends would have been celebrating his 30th birthday Monday, February 7. It was Perales' dream of becoming a police officer that brought him to Orlando about a year ago. The rookie cop had been an EMT in New York for nine years. But his passion for public service came to a sudden halt over the weekend. Perales was on his way home from work early Saturday morning, when his car left the road on I-4 at Kirkman Road, hit a guardrail and killed him. "He was a survivor of 9-11. He was in tower two when tower one came down. It's a testament to his courage and commitment to pubic safety to continue in this profession," says Sgt. Brian Gilliam, OPD. Orlando Police Department?s traffic homicide division is investigating the crash and his family and friends can't comprehend how something like this could happen to someone so dedicated. A memorial service is scheduled for Tuesday at the St. James Church at Orange and Robinson in downtown Orlando. His body will be flown to New York and buried in Long Island. Copyright 2005 by wftv.com. All rights reserved. The Orlando Police Department has set up a trust fund with Wachovia Bank to help Perales' young family with their future needs. Donations can be made at the Orlando Police Department, with any on-duty uniformed Orlando police officer, or beginning Monday after 10 a.m. at any Wachovia Bank branch. 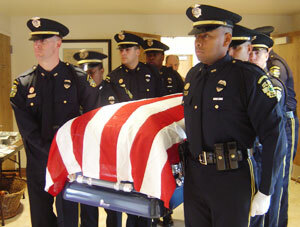 Please make checks out to Orlando Fraternal Order of Police Lodge #25. The Orlando Police Department is located at 100 South Hughey Ave., Orlando, FL 32801. 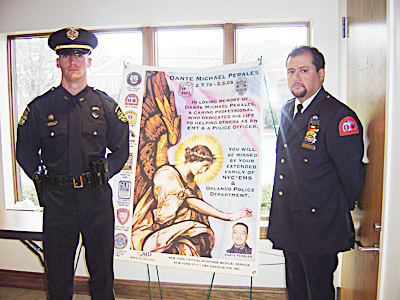 The banner produced for Dante Perales flanked by his friends. A police officer from the Orlando PD and George Contreras President, NYC*EMS Association, Inc. and former Director of EMS at St Clare's Hospital. This image is free to download for personal use and may be printed by anyone with a computer and desktop printer. You are engcouraged to print and share this image with others. This image is copyrighted and all rights reserved. Nobody can resell this image for a profit without written permission from ArtAID. ArtAID does not seek to profit of this tragedy, nor should anyone else! Special Edition prints, customized to your specific fund raising project, are available for distribution only to bonafide charitable organizations. Please email us your request.